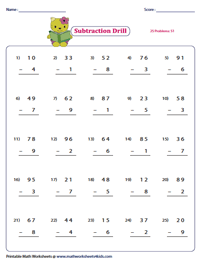 Students of Grade 2 and above can strengthen their subtraction skills at both regrouping and no regrouping with 2-digit and single-digit numbers with this ensemble of vertical and horizontal formatted drill worksheets. Set the timer and let the students solve these minute drills on time! You will also find a number of ready-to-use free printable worksheets at your disposal. 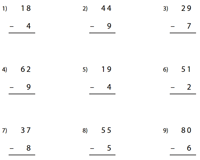 This set of column and horizontal worksheets with 15 problems per page helps reinforce a young learner's skill in subtracting a single-digit number from a 2-digit number. Get ample practice in 2-digit minus single-digit subtraction with these drills that feature 25 problems per page presented in two different formats. 'Download the set' at the click of a button! 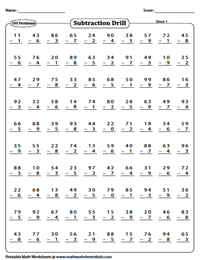 Find the difference between the 2-digit and single-digit numbers with these columnar and horizontal formatted drill worksheets that contain 50 subtraction problems per page. These 2-digit minus single-digit drill worksheets that feature 75 problems per page are sure to make your child a wizard at subtraction! 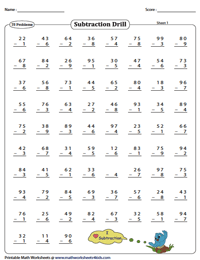 Use the timer and let the children sail through this series of worksheets. Help students move up one more level to prove their prowess in subtraction with this assembly of worksheets that contain 100 problems per page.